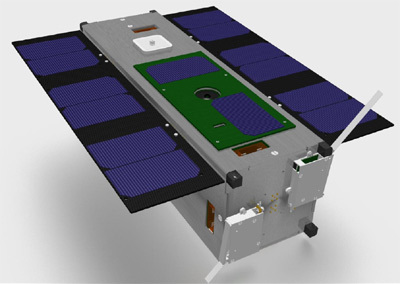 Space researchers at the University of Surrey's Surrey Space Centre (SSC) and SSTL have developed STRaND 1 (Surrey Training Research and Nanosatellite Demonstrator 1), a nanosatellite containing a smartphone payload that was launched into orbit around the Earth in 2013. STRaND-1 was built in engineer's free time and using advanced commercial off-the-shelf components, which fits perfectly with SSTL's innovation and low-cost philosophies. The phone runs on Android's powerful open-source operating system. A powerful computer, built at the Surrey Space Centre, tests the vital statistics of the phone once in space. The computer checks which components of the phone are working normally and relays images and messages back to Earth via a radio system. Once all the tests are complete, the plan is to switch off the micro computer and the smartphone will be used to operate parts of the satellite. STRaND 1 features two tiny propulsion systems: WARP DRiVE (Water Alcohol Resistojet Propulsion system), a novel new propulsion system that will help the cubesat to perform manoeuvres and a pulsed plasma thruster system which will provide full-axis control with low power, mass and volume requirements. STRaND 1 was successfull launched into orbit, but failed to respond.